North side, originally uploaded by Oran Viriyincy. The 80-foot deep Broadway light rail station “box” is nearly complete. Last week, Sound Transit said contractors only had about 10,000 cubic yards left to dig out of the 100,000 cubic-yard job. You can read more about the milestone in this update from Seattle Transit Blog. Thanks to STB for the picture on this post. We’ve included a slideshow with some more of their images taken at the construction site last week, below. Sound Transit said earlier this month they expected to reach the final depth for the station box dig by this week. 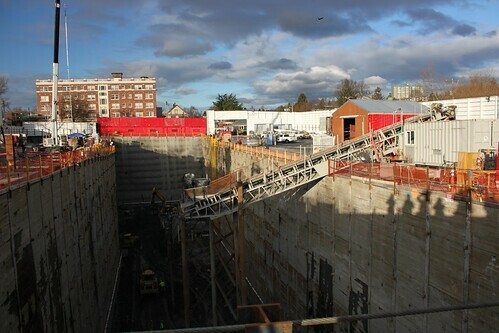 Even with the end of station box excavation, there’s still plenty more digging left to come as twin tunnels are completed between the University of Washington and downtown. The Federal Transit Administration announced they are advancing more than $22 million of the $813 million in funding for the University Link light rail project the agency is on the hook for. The FTA says the early payment comes from a pool of $182 million in “unallocated” 2010 budget funds. Sound Transit is extending its existing Central Link light rail transit line from its northern terminus at Westlake Station in downtown Seattle to the University of Washington, 3.1 miles to the northeast. The University Link corridor is the most densely developed residential and employment area in the Central Puget Sound region and the state of Washington. The extension is expected to serve more than 70,200 weekday riders by 2030. The project is estimated to cost $1.947 billion, with a federal New Starts share of $813 million. According to Sound Transit, crews are working 10 hour days Monday thru Friday from 7 AM to 5 PM and truck traffic at the site averages 18 – 19 trucks per day, hauling away dirt from the excavation. Sound Transit says the jet grouting at Pine Street near the Paramount Theater is complete and the street has been reopened. The contractor will now level the site, creating a pad for the crane which will remove the tunnel boring machine when it completes its first tunnel next year. Any sign of that giant crane we’re supposed to see on the Hill yet? Our favorite construction update sent out by Sound Transit to end 2010? Neighbors are also reminded that this is a closed construction site. Gates are open only for trucks and construction workers to pass in and out. The construction site is NOT a suitable shortcut between 10th Avenue and Broadway. Speaking of rules, this, Mayor James, is cheating. SDOT reached two key milestones recently to move the First Hill Streetcar line closer to the start of construction. SDOT completed the evaluation process for selection of the project general contractor/construction manager (GC/CM). This was a best value process based on qualifications and proposed fee for construction management services. The apparent best value proposer is Stacy & Witbeck, Inc. The GC/CM will manage the scheduling and day-to-day construction activities that go into making the First Hill Streetcar a reality. Stacy & Witbeck are highly qualified, with experience as builders of the South Lake Union Streetcar and the Portland Streetcar. SDOT has also issued an Industry Review Draft of a request for proposals (RFP) to manufacture streetcar vehicles for the project. At least six streetcars will be needed for the 2.5 mile First Hill line. The new streetcars will be very similar to those now operating on the South Lake Union Line. After receiving comments on the draft from potential suppliers, SDOT will issue a final RFP, with selection of a supplier anticipated by mid-2011. To learn more about the First Hill Streetcar, visit the project homepage. But it bothers me that ST is completely silent regarding the immense amount of community support for a streetcar line that serves ALL of Broadway and that doesn’t try to turn them around at the busiest intersection on the Hill. The City and ST need to step up and figure out how to make the funding available. There’s a lot of federal funding for mass transit right now and, at a minimum, ST ought to be getting bids for the full project, including the extension, so that planning can continue. Getting a bid for the full project may even suprise ST as many contractors are offering great deals in order to solicit work. I’m not Mayor McGinn’s biggest fan, but why has he, a self-professed transit fan, been virtually silent on the proposed extension? We need some leadership in addition to community support. Remember, the streetcar can only run as far as the college at first – as they can’t build the portion that crosses over the tunnel below Broadway until AFTER that tunnel is built – during station construction (2016). The extension to Aloha is included in the construction contract as an add-on, so the city just needs to find the funding to make it happen. I’ve heard that the city council is in favor of the extension and that next year SDOT will be seeking grants to pay for it. Yes, I was aware of the initial route only as far as SCCC until the underground walkway is completed. I hadn’t heard that the full extension is included in the construction contract since ST has, so far, failed to endorse the extension. Although the City Council likes the idea, the extension, or even the streetcar, were not mentioned during the Mayor’s walk on Broadway. Can anyone give an “in the know” update regarding the contract scope?